Few franchises have as a concept as instantly evocative as The Purge. The allegory-heavy property puts forth the premise of an annual 12-hour period in which all crime in the U.S. is legal, introducing the idea with the series' first movie in 2013. That film, a home invasion thriller, was only a tease of what the concept would grow to involve. The second and third films expanded the near-future world, heading out into the streets on Purge Night and doubling down on the series' grisly violence. But while the franchise has continued to provide different perspectives on the Purge, it has yet to fully delve into the mysterious architects behind the event, the New Founding Fathers of America. 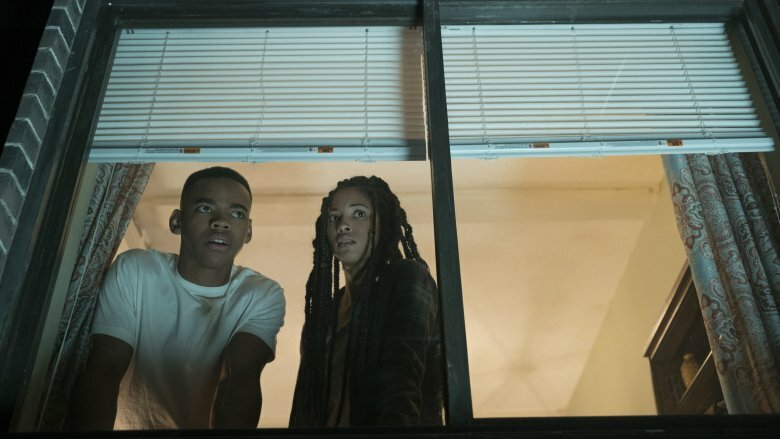 The fourth movie, The First Purge, takes audiences back to the initial experimental instance of what would later become a divisive, violent national tradition. Set in locked-room style on the New York City borough of Staten Island, the horror-thriller hybrid provides the clearest look yet at the beginnings of the Purge as a national institution. The prequel also leans harder than ever into timely social commentary, with a number of evocative references to real-world tragedies fueling its runtime. 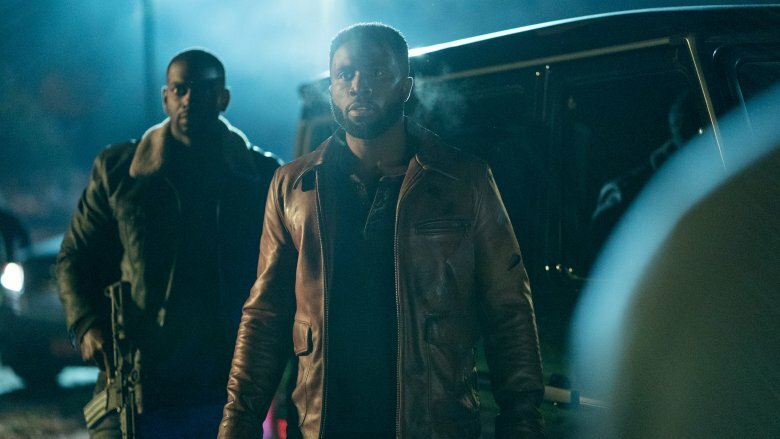 If you're not sure you picked up on everything the movie was putting down, keep reading as we break down the ending and thematic takeaways of The First Purge. 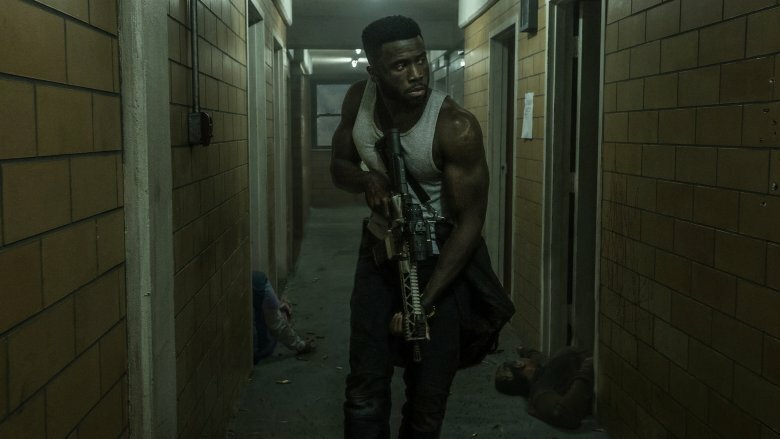 Act three of The First Purge kicks into gear with a vengeful bang, turning from a suspenseful horror flick into a full-on action movie as drug kingpin Dmitri storms the towers of the Park Hill housing projects to protect his friends on the 14th floor. By this point, the movie has officially turned from a citizen-on-citizen free-for-all into a government-sanctioned extermination campaign, as the international militia hired by the NFFA begins clearing the building floor by floor. There's a bit of dramatic irony to the fact that the only defender available to the vulnerable people in the housing project is the friendly neighborhood narcotics salesman, who — thank the Lord — apparently happens to spend every moment away from his business lifting weights, eating chicken, and getting insanely adept at using firearms. Far from the typical media portrayal of a predatory drug dealer, Dmitri is a homegrown Batman figure, his neighborhood's wealthy, well-equipped, most capable defender. Unlike the hyper-right wing government and ruling class that is literally trying to kill the neighborhood, this businessman-turned-warrior is an authority figure who values his community and keeping people safe. Suffice to say, he's not your typical protagonist, and it's one of the things that makes this particular Purge installment so intriguing. 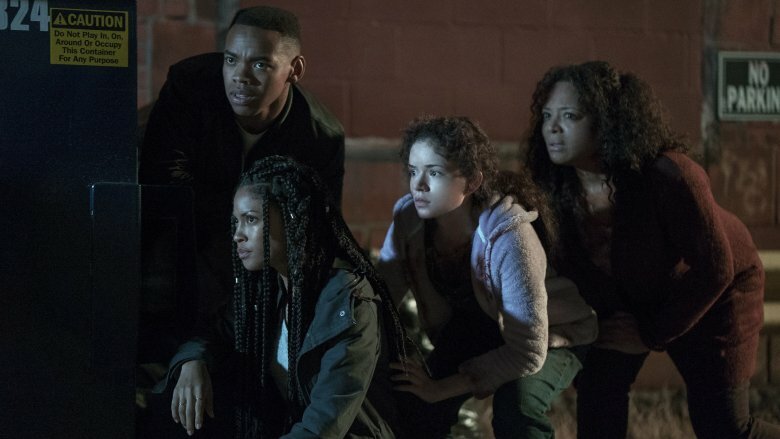 The First Purge sticks the knife into any sense of hope the audience might have with the undignified assassination of Marisa Tomei's character, Dr. Updale, the architect of the experimental Staten Island Purge. An unbiased (if remarkably unethical) researcher, Updale embarks on the Purge experiment with intentions that are solely based in science, following the event to see what it says about human behavior. She doesn't really care if everyone on Staten Island kills each other — as a scientist, she's interested in whatever the results might show her. Unbeknownst to Updale, this purely data-driven approach puts her at odds with the New Founding Fathers, represented in The First Purge by the NFFA-allied politician Arlo Sabian. According to her observations, people left to their own devices aren't at all inclined toward violence on Purge Night, preferring instead to party in the streets en masse more rambunctiously than the law would typically allow. It's a finding that's essential to the thesis of the movie, which is that human nature tends toward kindness, peace, and community, not sociopathic violence. That aspect only comes into play when an external agent seeking to control the population — in other words, the nefarious NFFA — presses its whole fist down on the scale in a brute force attempt to skew the study's results. After two acts' worth of tension in the streets, the government takes the gloves off for the movie's brutal finale. At this point, the undercurrent of class warfare and exploitation of the poor that has informed the whole series is revealed in all its unambiguous ugliness, as the Purge is identified as a tool explicitly designed for the extermination of the lower class. The movies' national unemployment rate and economic deficit are convenient excuses to hang the Purge on, but the event isn't a solution so much as it is a scapegoating of society's weakest, doling out free passes to the forces in control that are actually to blame. Suffice to say, in a country where the economic divide between the upper and lower classes has never been more dramatic, this is a message that resonates. In our real world, blame for the dire circumstances of the lower class often gets placed on the people in that class rather than the parasitic and powerful forces working mercilessly to exploit them. Corporations and international conglomerates plunder cities, states, and entire nations of tax dollars, enriching private entities around the world without investing any money back into the communities they profit from. As a result, those communities and their economies stagnate. But instead of examining the behaviors of the super-rich elite, the victimized and exploited poor are the ones who get criticized. In the just-slightly-heightened world of The Purge, they're intentionally exterminated. The NFFA isn't just relying on its private militia to exterminate the poor. No, this government of grade-A jerks, to borrow a mildly upsetting phrase, knows quite well that there's more than one way to skin a cat. In order to make sure that the experimental first Purge actually pops off, agents of the NFFA inject a massive influx of heavy weaponry into the Staten Island black market. Most of these weapons are handily requisitioned by Dmitri's staff, who use the formidable arsenal for their own counteroffensive against the government-sponsored invaders. But as it's reiterated while Dmitri and company are getting their loadouts together, the NFFA's first plan was to have the population tear itself apart during the Purge with the mysteriously sourced weaponry. This plot turn speaks to a number of tactics that have been used or alleged to have been used by the U.S. government. As The First Purge establishes, the NFFA believes that death needs to happen on a massive scale during the Staten Island experiment in order to create the political capital for a national Purge. To achieve that end, they're willing to to arm the population with heavy artillery. It is 100% fact that the U.S. government sends weapons all over the place to aid with causes, nations, and groups or governments that it supports around the world, directly fueling conflicts for its own benefit, making this another instance of the movie taking something real and putting a little twist on it. At first, Dmitri returns to the Park Hill towers with an entire squad of soldiers, all strapped with choppers and just ready for war. But as useful as the whole team would be in fighting back against the NFFA's hired militia, a coordinated squad assault is just not meant to be. Instead, the deck is stacked against the Staten Island residents, as everyone but Dmitri gets mercilessly gunned down by a group of machine gun-equipped flying drones. As with everything else in the metaphor-heavy First Purge, there's a political message in this massacre. The drone attack plays on two fears at once — the long-controversial use of drones in state combat as a form of asymmetrical warfare, and the use of drones by the U.S. government to kill American citizens without trial. As dystopian as both of those things sound, they're both informed by our reality. Drone attacks are a well-established tactic the U.S. government has been deploying on battlefields for years, harming or killing innocent people in the process with unconscionable frequency. And U.S. drones don't just fly overseas — they fly the skies domestically, conducting controversial surveillance on the population. Beyond surveillance, they've also been lethally deployed against American citizens overseas, establishing a chilling precedent that The First Purge takes to its logical conclusion when the repressive government uses the technology to fatally shut down an effort of resistance to state tyranny. The racial politics of the Purge series have never more explicit than they are in The First Purge, which clearly wraps the ruling NFFA and its allies in recognizable symbols of white supremacists. In other words, it's not just a class war the NFFA is gunning for — it's a race war with a Nazi-esque mission. 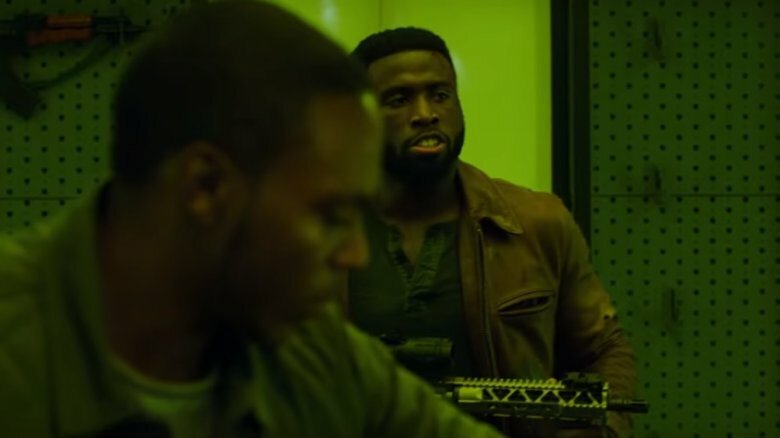 It's no accident that the fourth Purge movie features a cast composed mostly of black people, because the theme of white violence against black communities is at the center of the message the movie's trying to convey. The movie plays with potent iconography — almost too potent, with its inflammatory visual references not always being wielded in the wisest of ways. 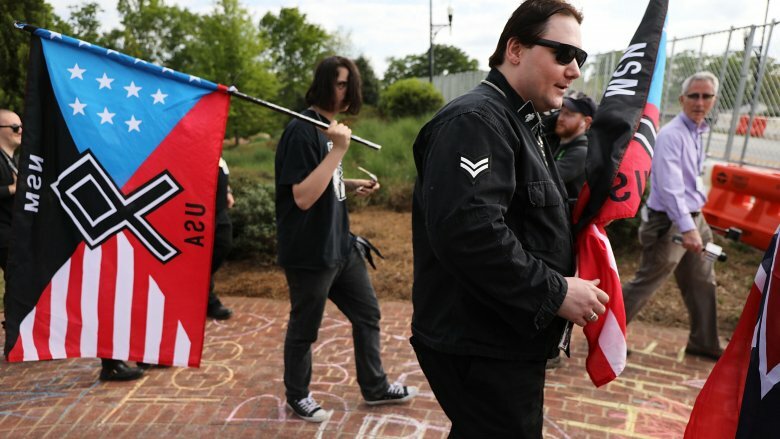 Put simply, there may be no image that's Purge-ier than the red, white, and blue KKK-style hoods that some of the invaders wear while they tear through Staten Island. Beyond that unsubtle display, there's also the real jerk of a guard who gets caught wearing a blackface balaclava, a mercenary dressed like an SS officer, and several extremely uncomfortable instances of racist violence. Some examples include a man seen being dragged behind a motorcycle in an act of torture, and a church full of minorities being invaded by an extralegal death squad. All the while, the killers conduct their business while bearing torches and wearing crosses that clearly evoke real-life hate symbols. It's heavy, potent stuff that the movie doesn't always deploy gracefully, making for bracing moments that get way too real. The most clever aspect of The First Purge is how the poor are coerced into sticking around and participating in the experiment, being offered $5,000 to stay on Staten Island with bonuses on top for additional participation — i.e., more cash for more kills. The fact that people put their lives and morals on the line for money has plenty of parallels to our real world, where the poor have historically been exploited financially. People are lured into disadvantageous schemes by the promise of short-term gains, entering into manipulative deals that aren't long-term beneficial. One government-sponsored example was the highly-unethical Tuskegee syphilis study, in which the federal government coerced people into signing up for medical experiments against their best interests. Enticed by the promise of free medical care, participants were kept sick for decades for the purposes of a scientific experiment. These sorts of deals are vicious trade-offs, entered into by people with no money and no options — and it's a phenomenon The First Purge represents beautifully. The "cash for kills" concept is best embodied by the high-on-life crackhead Skeletor, who begins the movie as a terrifying agent of chaos before turning, by the movie's climax, into a militia-destroying avenging angel. There's a delicious bit of irony coloring the bad guys' demise during Skeletor's last stand in the housing projects, considering he wouldn't have been in a position to do away with the government's goons if he hadn't first been coerced by the government to kill. The movie ends in fire as the showdown in the Park Hill projects comes to a violent, C-4-fueled conclusion. The end of the fight just happens to coincide with the end of the 12-hour experiment period. Just like that, the island is returned to a state of relative calm. After the shootout, Dmitri, Nya, Isaiah and Dolores descend the tower and join the crowd outside in the light of dawn, reconnecting with the community after a calamitous night of violence. Instead of tearing each other apart as the NFFA intended, the citizens defended each other against the threat of outside invaders — a moral victory, if nothing else. As the movie ends, the Purge is over — now, to paraphrase the movie's final words, it's time to fight. The movie's hopeful ending stands in contrast to what we know about where the story is going. The residents of Staten Island don't succeed in stopping the Purge from spreading nationwide, and the tradition does not end for, as is implied by The Purge: Election Year, potentially decades. 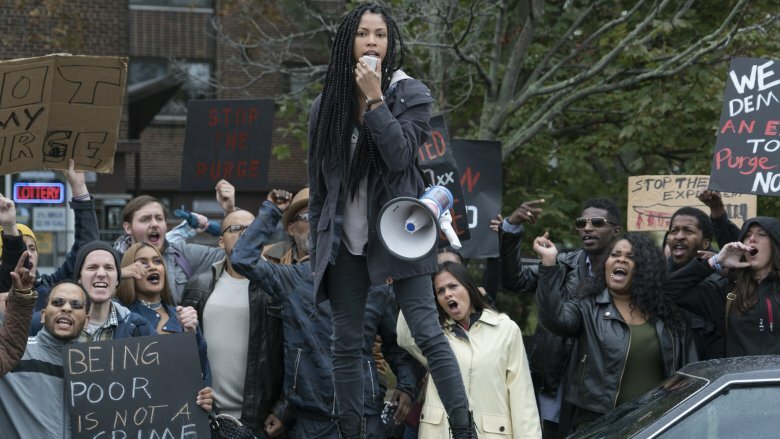 Despite this, the movie concludes to the hopeful strains of Kendrick Lamar's "Alright," a modern-day anthem of resolve and resilience that is here used to represent resistance. No matter how many Purges ultimately happen, people will always try to survive. Even in the face of such a hopeless dystopia, people will still fight. In a series this bleak, that's a victory in itself. 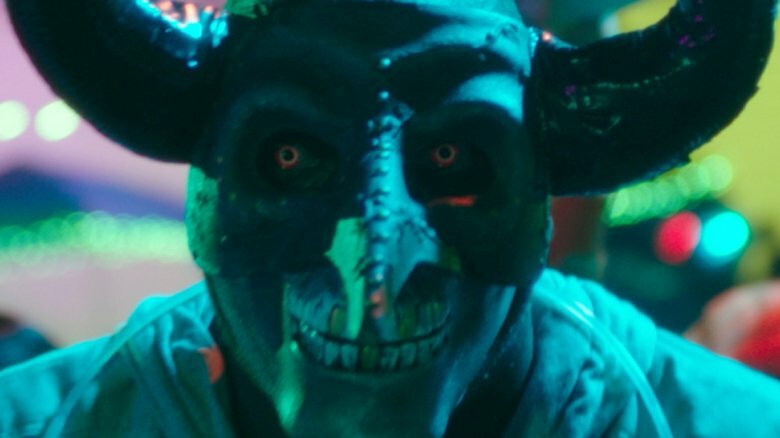 If you stuck around The First Purge through the first bit of the credits, you might have been greeted with a burst of static and a trailer for the upcoming Purge TV show. 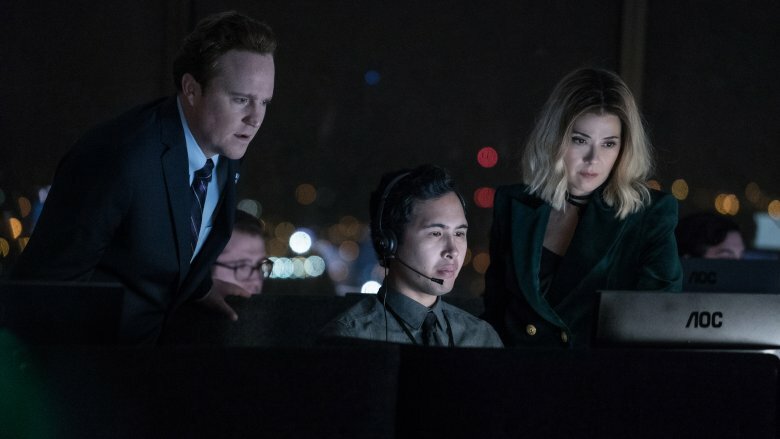 Set to premiere on the USA Network on September 4, the show is a ten-episode series set ten years after The First Purge. Where the movies so far have focused mostly on the hours just before, during, and just after the annual Purges, the series will delve more deeply into the mindsets and inner lives of the Purge's participants. 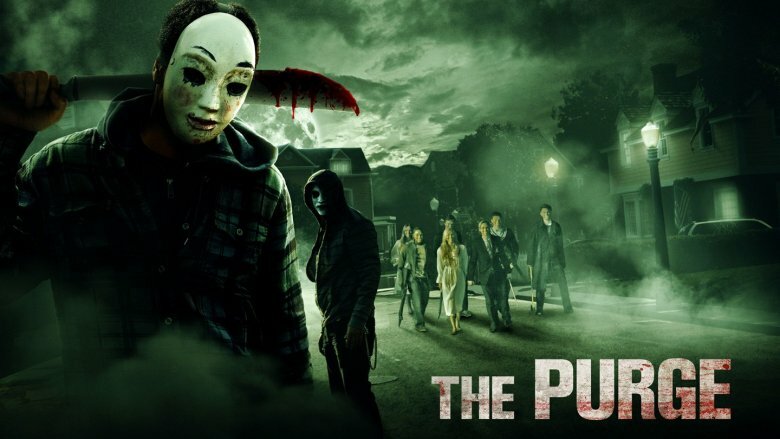 According to series creator James DeMonaco, the show will unfold in an anthology style, following its cast of characters over the course of days before peoples' paths converge on Purge Night. At the time of this writing just after the movie's debut, it's not known if we'll be getting more Purge films in the future beyond 2018's TV show. Despite the seemingly limitless potential of the Purge concept, the movies have stuck to something of a formula. It begs the question — after five years, four movies, and a TV show, should there even be a fifth Purge? That's not for us to decide. But if real-world inequality keeps getting more and more extreme, you can bet there will be material for these allegorical thrillers to mine for years to come.